News - Zhejiang Taizhou Wangye Power Co., Ltd. The advantage of diesel engine power, good economic performance. 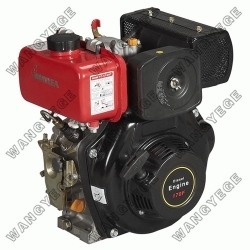 Diesel engine and gasoline engine working process has many of the same place, each Working cycle has gone through the intake, compression, acting, four stroke exhaust. However, diesel fuel for diesel, its viscosity than gasoline, which is difficult to evaporate, while its auto-ignition temperature is lower than gasoline, so the combustible mixture formation and ignition gasoline engine with a different way. The main difference is the diesel engine cylinder pressure in the fuel mixture is, not lit. Work into the cylinder diesel engine is air, compressed air cylinder to the end, the temperature up to 500-700 ℃, pressure up to 40-50 atm. Piston near top dead point, the engine on the high-pressure pump to the cylinder under high pressure diesel injection, diesel oil to form fine particles, mixed with high-pressure high-temperature air, on their own diesel mixture combustion, severe swelling, generates power, push the piston downward acting , then the temperature up to 1900-2000 ℃, pressure up to 60-100 atmospheres, resulting in great power, so the diesel engine widely used in large diesel vehicles. The energy saving and carbon dioxide emissions in diesel engine's advantages, it is including gasoline, including all heat engines can not be replaced, therefore, advanced small high-speed diesel engines, which have reached the Euro III emission standards, a "green engine" now many new cars in Europe and America has become the power plant. Copyright © Zhejiang Taizhou Wangye Power Co., Ltd. All rights reserved.